Recently I started working on automating the second stage backups on my server. In contrast to plugging in manually a hard drive and start the backup script by hand I wanted to have a cron job which does the thing automatically. For this to work, the hard drive needs to be connected to the system all the time. My server at home is an ODROID embedded board. One of the reasons, besides many others, why I prefer this over a “virtual private server” is cost. The ODROID only consumes 1.5W in idle, which is equivalent to 4€ per year. When I added my second stage backup hard disk, I noticed that the power consumption increased by 2W. Note that this is the consumption when the disk is not spinning. This is quite horrible, because the disk needs to run only once a month for some hours. Thats where my hacker instincs said: “There has to be done something to make this better”. 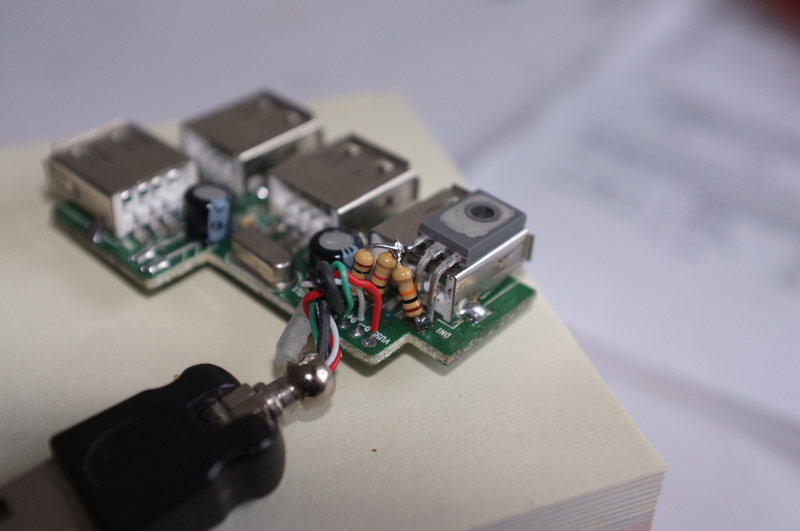 My first idea was to use one of those manually switchable hubs as seen in the image below. I would have thrown an AVR in there, connected it to one of the USB ports and replaced the mechanical switches by transistors. This way I could have switched the hard disk completely off. This looked doable but also a bit too complicated. That’s why I continued to look if the USB standard offers a similar functionality. And apparently it does! It is call per port power switching (PPPS). Nice! See http://tiebing.blogspot.de/2011/01/use-linux-to-control-outlet.html for an introduction on how to check if your hub is compatible. However, although most of the USB hubs advertise that they are able to do PPPS, they actually are not supporting this feature. 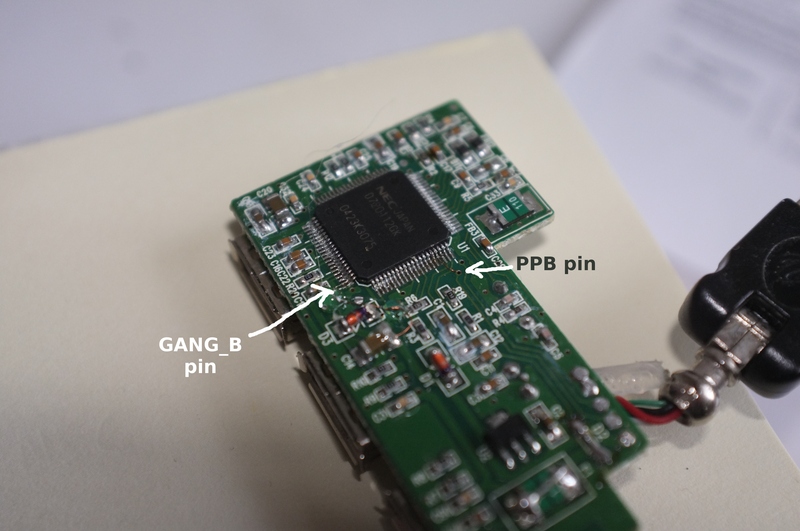 The reason for this is that the chipsets inside the hub usually support PPPS (and advertise themselves as so) but the manufacturer of the hub omitted the switches (to save costs) and instead connected the USB ports directly to +5V. The USB hub I had (no-name china crap “ID 0409:0059 NEC Corp. HighSpeed Hub”) did not advertise itself to support PPPS. I cracked it open anyways to see what chip it used. It was the uPD720112 from NEC. And according to the datasheet, it does support PPPS. The trick to enable it was to tie the configuration pin GANG_B to +3.3V. After that the chip did advertise itself as PPPS compatible 🙂 Of course PPPS was still not working as this hub is missing the power switches. To switch the port on and off, I used the following program: http://www.advistatech.com/software/hub-ctrl-20060120.c. A nice feature in the case of a hard drive connected to a switchable port is that you can make the power switching transparent to the user. This can be done by the help of autofs. The parameters for the bus and device id of the hub can be found with the command lsusb. After switching on the port, the script waits for two seconds until the hard disk is recogcnized by Linux. Then the location of the hard disk is reported back to autofs by the echo statement. If you access /mnt/usbdisk/sda1, autofs will call the script above, which turns on power to the hard disk. After that, autofs will mount the file system and you can access the data. Pretty neat! After a timeout (the default is 600s) autofs will unmount the file system. I haven’t found a hook to this event to also turn off the power of the usb port. Instead, I wrote a little script which checks if the disk is still mounted. If this is not the case, it is safe to turn off the power. echo "Usage: $0 <disk device> <busid> <deviceid> <portnum>"
echo "$0: $1 is mounted. Doing nothing"
echo "$0: $1 is unmounted. Turning power off on bus $2 device $3 port $4"
To be honest, a fixed bus id and device id is not the most elegant thing. A script which finds the bus and device id of the hub automatically is still on my todo list. 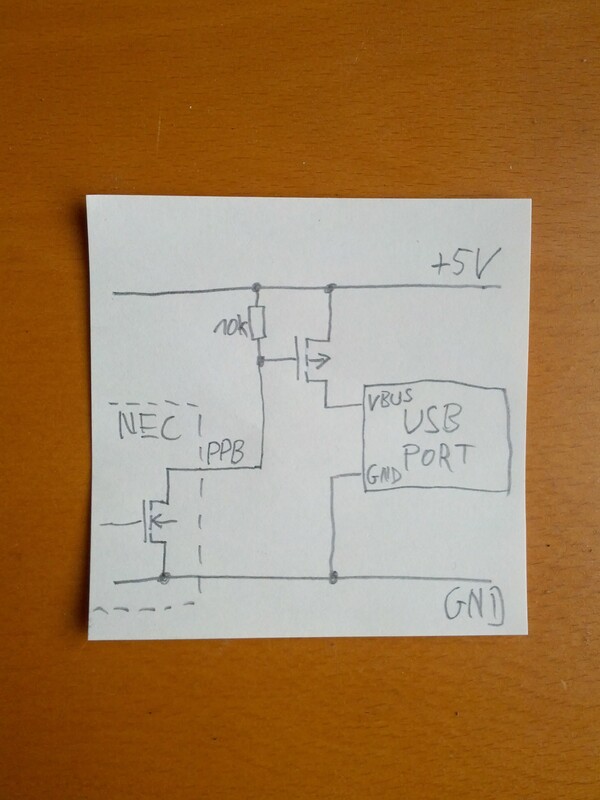 So, in summary this post showed you how to enable per-port power switching to off-the-shelve USB hubs. In my case, I use it for switching off two hard disks, a USB TV receiver and a USB sound card. This saves around 10W, which is equivalent to 30€ per year. The best thing about this is that this does not create any overhead for me as the devices are all powered on and off automatically. The name here is important. The first part is the name of the partition, _partition needs to be fixed! This can be done with as many disks as you like. Only the first and the last step have to be repeated to add another disk. How to use all this? Well, simply access /mnt/data and the disk will be powered on and mounted. That’s all 🙂 The crontab entry then takes care of removing the power. power_off_unmounted_disk: This script powers off a disk if the partition is unmounted. This does not work with multiple partitions! If another partition on the same disk is still mounted the disk will be powered down. Argument is partition device (/opt/data_partition). This is intended to be called by cron. Personaly I use a yepkit switchable usb hub that allows me to turn on/off any of it’s downstream ports just by executing a command. I incorporate these command in the rsync scripts for backups in order to automaticaly power the usb hdd On when the backup starts and tur the usb hhb back to Off once the backup finishes. Thanks for the link! That’s a good alternative if you don’t want to dig into your USB hub. Discussion of underlying chipset too in that thread. Cheers!